THERE is a collection of Eva Braun items. A familiar personal photograph of her (top left) with her black Welsh terrier ?Stasi (with terrier ?Negus) on the Berghof terrace, and a [1936? 1942? 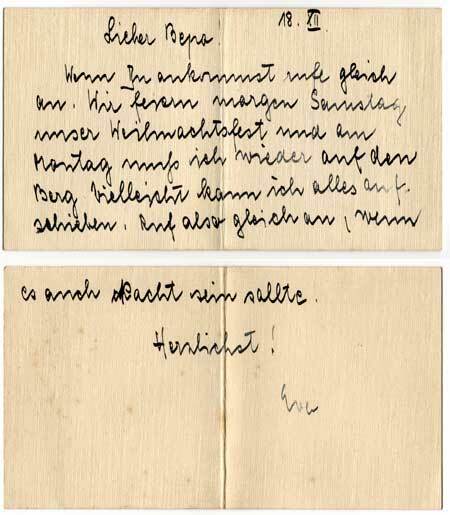 *] message in her handwriting on the back: "Lieber Bepo. Ich danke Dir herzlich für Photos und Briefe. Hoffentlich hat Dich mein Päckchen erreicht. Heute sende ich Zigaretten usw. Zugleich auch an Deine beiden Kameraden. Leider habe ich nicht mehr Geräuchertes. Uns geht es gut. Von Dir dasselbe hoffend bin ich mit österlichem Grüße die Umseitige" [i.e. 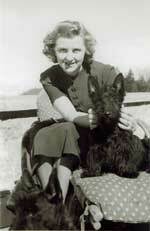 Eva Braun]. * Website note: Since only 1936 and 1942 had December 18 on a Friday during the Hitler/Eva relationship, this card dates from 1936 (in 1942 Hitler was at Rastenburg on the day in question). However American researcher Phyllis Ring ("who's undoubtedly spending far too much time researching this particular life") disagrees (Monday, September 28, 2009): "Many thanks for the hugely helpful resource your site provides. 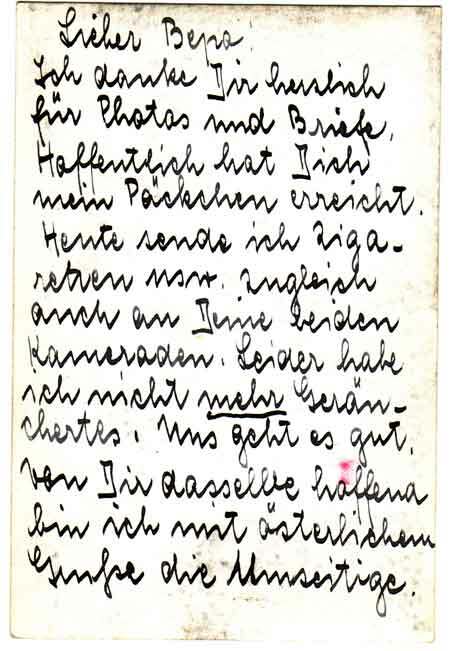 Regarding the photo of Eva on the Berghof terrace with one of her dogs, with a message on the back, and the other card with message dated "[Freitag] 18.XII: Another photo from the same day (same dress, hair, terrace scenes, etc.) has a March date in 1941 and "Ostern" written across the bottom in her handwriting. Other photos from the same day also show AH in military uniform. (I checked these against photos of her from the NARA albums that I digitally saved.) Thus, this photo and message and the other card may more likely have been penned in 1942 than 1936, perhaps? (Her hair and clothes in the photo are more typical of the later date.)"